The Peled Company specializes in the importing, marketing and installation of roller shutters and solid wood and wood/aluminum windows and doors. Our projects range from nature conservation and preservation plans to the construction of private homes and hotels. 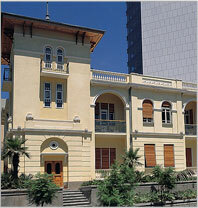 Our company is committed to the architectural conservation of Tel Aviv’s unique history. Yossi Peled, our founder, was contracted to install wooden shutters for the Russian Embassy building on Rothschild Boulevard, Tel Aviv in 1994. Shortly thereafter, the building was the first of its kind to be awarded conservation status. Many historic buildings have since followed suit. By identifying the preservation trend at its inception in the early 90s, and by utilizing his love of natural materials, Peled established a company specializing in roller shutters and wooden windows and doors. Contracted by the Tel Aviv Municipality’s Department of Restoration, the Peled Company has quickly come to be recognized as the leader in building conservation. Over the years we have participated in the restoration of dozens of historical buildings across Tel Aviv and helped to preserve the distinctive style of Jaffa and Jerusalem. Many restoration projects on Tel Aviv’s celebrated Rothschild Boulevard are adorned with Peled’s wooden shutters. Imported from Italy, our products combine the traditional knowledge of wood sanding with the handcrafted work of our artisans. Our products protect against the most harmful UV rays and prevent unwanted termite and pest infestations. We hold ourselves to the highest standards of quality and durability. We also offer the option for custom made products tailored to client specification. Only upon receiving an order are the materials prepped and the product created, formulated exactly to requirements provided by the client. Based on superior product quality, convenient service, and accumulated industry knowledge, the Peled Company is recognized by both customers and service providers as the most prominent and reliable in the business.